1. In an increasingly global economy and mobile society, many graduates will live abroad at some point—or live and work in multinational and multicultural environments in the United States. Study abroad expands their horizons as they gather new perspectives on potential careers, lifestyles, and working cooperatively across cultural and national boundaries. 2. One of the biggest motivators for study abroad is acquisition of second or third languages. Students improve their fluency by immersing themselves in the language, surrounded by native speakers, as well as studying literature and other subjects in the foreign language, thereby gaining more nuanced understandings of academic topics, self, and society. 3. Study-abroad students take advantage of course offerings and disciplines as well as teaching traditions that are different from those available at Swarthmore. This enhances the breadth of their undergraduate academic program, e.g., the strong math and science programs in Eastern Europe or numerous field study programs around the globe. 4. Study-abroad experiences that include a volunteer opportunity enhance students’ application of academic study and align with the College’s mission of encouraging students to grow as responsible global citizens who are engaged in evolving civic and social dialogues. 5. Students report that traveling independently and exploring cultural and personal heritages are two additional very valuable rites of passage. 6. 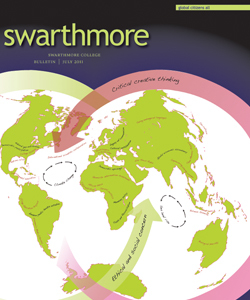 Reports from returning students also reveal that spending a semester away from the Swarthmore campus and curriculum encourages some students to pursue new interests, both curricular and extra-curricular. They wake up to themselves in ways that can be transformative to their life journeys.